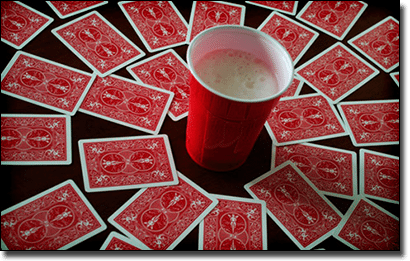 Card drinking games can be some of the best games to play, and while this could predominantly be because we are having a few lovely alcoholic beverages, we can’t help but wonder what they’d be like as a real money casino games. Wagering money would replace wagering alcohol, and we’ve taken five popular card drinking games to test their potential as online casino games. Pyramid requires a lot of memory and concentration, so it doesn’t make a lot of sense to play while intoxicated. With real money, however, it could be an excellent live dealer table game, but we’ve added a few tweaks to make it work online. A pyramid is created from a 52 deck and the dealer and the player is dealt five cards. The dealer cannot see your cards and you cannot see the dealers, but you can see your own and the dealer can see theirs. The first card in the bottom row of the pyramid would be flipped and the player and the dealer can both say if they have the card. If the dealer says they have the card the player has to decide whether they really do or whether they’re bluffing and if they choose they are bluffing they need to Raise their wager. If they choose to Call, they lose their bet. In the original game, the cards are concealed to give everyone a better chance as players may have forgotten the order they were in, but online players could easily write these down so we chose to scrap this rule. This would work better with a bunch of other players, each streamed via their web cam and could potentially be the case the way the industry is going with live dealer titles. While this is a common drinking game, also known as Blind Man’s Bluff, it has actually been played as a gambling game before – though there are no online variants as of yet. 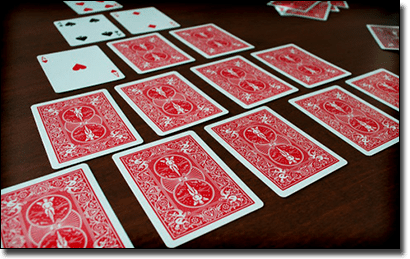 Every player – whether it is just you verses the house or a multiplayer title – puts on the ante and each player and the dealer is dealt a card. While the card is generally placed on the player’s forehead so everyone but you can see your card, online it would work by each player and dealer being able to see everyone’s card but their own. Based on what everyone else has, players can then either Call or Raise until everyone has Called. The player with the highest card would win all wagers. While reading poker faces when people are drunk can be a lot of fun, the addition of real money and the anonymity of the Internet makes this game a perfect fit for an online casino version. If you’ve drank anywhere in the world with a group of people, you’ve no doubt played King of Beers. Players sit in a circle and put a standard 52 deck of cards in a ring. A pot or jug is placed in the centre of the circle for the alcohol each player has to pour in once they’ve pulled a King. Once all four Kings have been drawn, the last player to have done so has to drink the pot. The rest of the cards – two to 10, J, Q, and A – each have their own action when pulled. For example, if you get an Ace, you are required to perform Waterfall, where the player who pulled the card starts drinking and everyone has to follow suit in a clockwise fashion, only stopping when the player before them does. For this game to be an online casino game it would have to be a multiplayer game – either against real players or the house – and the pot or jug would turn into a pot for wagers. Every time a player pulled a King, a percentage of their wager would go into it, so all players have the chance to win after pulling the Kings. For the other cards we’ve based it on the poker variant Red Dog where you are required to draw more than one card – although King of Beers only allows one card per turn. We’ve basically created our very own poker variant, which you can play instead of Kings next time your at a party. This game is potentially already available but not as a table game; rather, it is the Gamble feature available on many pokies, including Microgaming’s pokies. However, it doesn’t have the full offering the drinking game has. In our recreated online version of Red or Black, players first place a wager on whether the card will be red or black. If they get this right they double their wager, but if they are incorrect they start again. If they are correct they can then opt to collect or pick higher or lower than the previous card, once again doubling their wager if they are correct but losing it all if they are incorrect. Finally, players can continue if they have been right the first two times and guess whether the third card will be inside or outside the two cards, once again doubling their money or losing it all. Usually players drink instead of lose money when they are incorrect, but we would love to see this title as a table game as it is quite a simple addition – perfect for the younger crowd or those new to online gaming. Across the Bridge is another simple game like Red or Black, which makes it the perfect candidate to be turned into an online casino game. Ten cards are dealt face down in a straight line. Players place their wagers and the game begins with each individual card flipped over. If the card revealed is anything from a two to a 10 (the number) then the player has won and receives a small payout, with payouts increasing as you get further across the bridge, with the option to collect before each card is revealed. If the card is a Jack, Queen, King, or Ace however, the player loses and the round is over. The player can then decide if they wish to wager again. If the player manages to get all cards picture free, the payout would be huge, though if you’ve ever played the drinking version you know it can be quite hard to get across in one go. There you have it, five drinking games which have the potential to be transformed into online casino games. For now, you can visit our recommended card game casino sites and play an array of card games including 21, baccarat, poker, and array of unique variants.